Home » News/Sports » Jamaica’s national flower fights HIV! Jamaica’s national flower fights HIV! 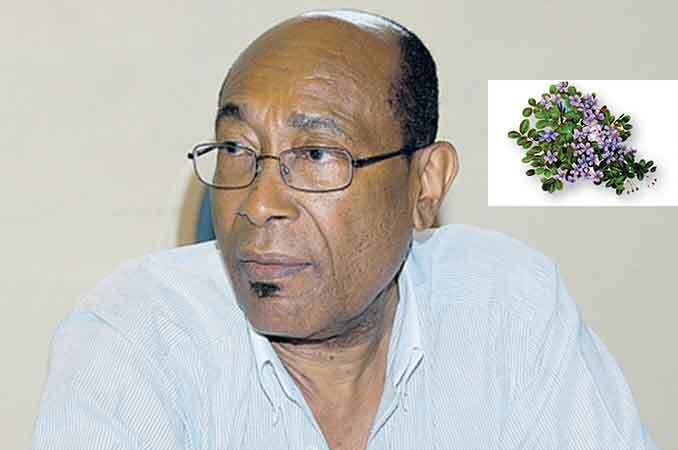 Noted Jamaica Entrepreneur and Research Scientist Dr. Henry Lowe’s pioneering Research and Development (R&D) work on Jamaican medicinal plants, has led to another exciting discovery. The discovery this time has to do with the Jamaica ‟s National flower, the Lignum vitae plant (Guaiacum officinale). Dr. Lowe and his Bio-Tech R&D team assisted by the Institute of Human Virology at the cutting-edge University of Maryland Medical School, have discovered that Lignum vitae has other special properties beyond its rare beautiful blue flowers. The research team noted that the Lignum vitae has potent bio-activity against the deadly HIV virus that causes the Acquired Human Immunodeficiency Virus (AIDS), a global concern. Although known from last year, because of its significance, the tests were repeated several times to ensure data accuracy. Since then the findings were published in the April 2014 issue of the prestigious European Journal of Medicinal Plants under the title: Anti HIV-1 Activity of the Extracts of Guaiacum officinale L. (Zygophyllaceae). Since then, a significant amount of additional data has been developed. According to Dr. Lowe, the findings are very important because HIV remains a major public health concern despite the discovery and development of Highly Active Antiretroviral Therapies (HAART).In Jamaica , it is estimated that 32,000 persons are living with HIV and as many as 50% are unaware of their status. Beyond that, UNAIDS reports that out of the over 30 million people reported to be living with the HIV virus worldwide, only about 6 million (20%) are receiving antiretroviral therapy. The remaining 80% are not on any medication due to lack of access, cost, adverse effects of drugs or other reasons. As such, there is a need to continue the search for new, effective, safe and affordable therapies for this major global pandemic. Dr. Joseph Bryant of the Institute of Human Virology at the University of Maryland (UM) Medical School, where the Global Viral Network (GVN) is located, stated that “the Bio-Tech R&D team lead by Dr. Lowe, need to be recognized and commended for bringing a gift of a major potential „magic bullet‟ from a Jamaican tree for the potential management of the HIV virus which causes AIDS. It is also symbolic that this discovery is being presented, when Jamaica is celebrating its national anniversary”. We are currently pursuing these potential drugs in collaboration with the Natural Products Division at the Research Triangle International, USA, which is known for its discoveries of anti-HIV drugs, and of course at the Institute of Human Virology at the University of Maryland Medical School. Based on this, we believe we are on the verge of identifying a potent major anti-HIV drug. Dr. Lowe who is the founder and lead scientist at Bio-Tech R&D Institute based in Kingston , Jamaica , plans to do further research on the isolates of the Lignum vitae in order to develop a treatment that could be used alone or as part of a cocktail for the management of HIV/AIDS in Jamaica and other countries. In the interim, a nutraceutical product is being developed. A US patent has so far been filed in order to protect this vital intellectual property. « Mount Rosser bypass to officially open tomorrow!